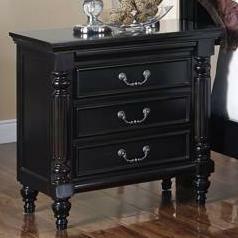 Accent your bedside with this gorgeous three drawer nightstand. 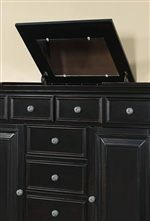 Drawer faces feature framed panels along with pewter color hardware that pops against the timeworn rubbed black finish of the veneers. 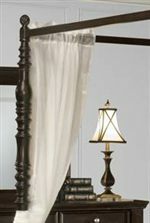 Traditional design elements are utilized in the form of turned and fluted accents that when paired with the distressed finish complete a transitional style. Conveniently store reading glasses, medications and much more within an arms reach for full functionality while relaxing in the comfort of your master suite. 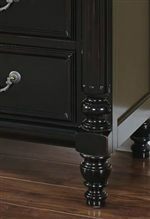 The Martinique Bedroom Transitional Nightstand with 3 Drawers by New Classic at Michael's Furniture Warehouse in the San Fernando & Los Angeles area. Product availability may vary. Contact us for the most current availability on this product.